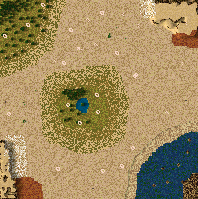 Hi, everyone this is my first map on this site. I hope you all like it. If you do please leave a rating.You might want to change the scenario and add the starting goods cause i forgot about that. Sorry. Story:You are your Lords most trusted Advisor. He thought that you would need a castle. So he sent you resources and workers. As your little community grew the King watched how it did. The rest of the story belongs to you,Player.